Gorman: I suppose a fundamental question remains: what is the relationship between this drawing and this painting? Because the drawing, I think, clearly is before the painting. You know, these are sketches and so on, and it’s clearly very closely related to the picture — it doesn’t seem to be a completely independent work. 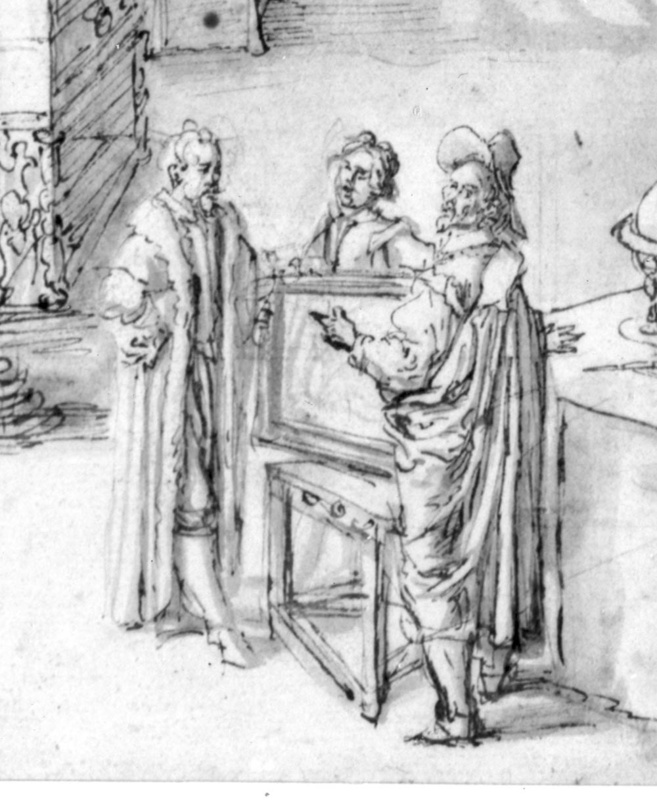 But the drawing, as you can see, is more conventional — it has the same octagonal table, it has the globe, but it has the more conventional picture of three connoisseurs conversing around a table, it has a dog — it is more in the traditional genre of gallery interiors. Cordover: And I would argue that two of those cognoscenti are easily identifiable. Cordover: I think that the figure on the right is almost identical to a self portrait by Peter Paul Rubens. Marr: Yes, I would say that. Cordover: And the figure on the left I think is also identifiable . . . .
Marr: Yes I think it is Peter Linder. Cordover: Do you think so? Gorman: Yes. And I also have a guess about who the figure in the middle is. Gorman: I saw it this afternoon. I think it’s Van Dyck, who was working in the Rubens studio from 1618 to 1620. Cordover: Now that you’ve said it, it conjures up that portrait of Van Dyck that does look just like this. Gorman: But if it is van Dyck, think about the drawing, — I think the drawing is memorializing a visit. 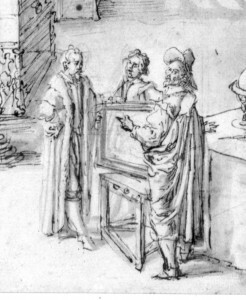 Perhaps Linder went to Antwerp for business between 1618 and 1620, and this was a visit where he met Rubens and van Dyck, and this is where the idea of him commissioning a gallery painting originated, and then this drawing was developed, possibly brought by Jan Brueghel the Younger to Milan. Then Linder and Oddi developed a more complex version of the composition and brought in the allegory, the deep mathematical content and the Kepler connection and so on and then that led to the painting. It’s just an idea. Cordover: Van Dyck went to Milan with Jan Brueghel the Younger, his close friend, in 1622. Weschler: The painting is painted in Antwerp or in Milan? Gorman: The painting could have been painted in theory in either, but it was definitely painted by an Antwerp painter and they didn’t tend to stick around in Milan for long enough to do much, so it seems more likely that it was painted in Antwerp but commissioned perhaps on the basis of a visit to Milan. The visit to Antwerp is certainly a possibility. While we don’t know Linder’s movements before the 1620s, and don’t have an explicit connection to Antwerp (other than the Linder interior itself), he traded internationally in luxury goods, of which Antwerp was a major producer, and Rubens was always keen to meet anyone interesting and well off! I reckon the Van Dyck identification is plausible, too, although that middle figure seems to me to be drawn less distinctly than the other two, the features somewhat less defined.